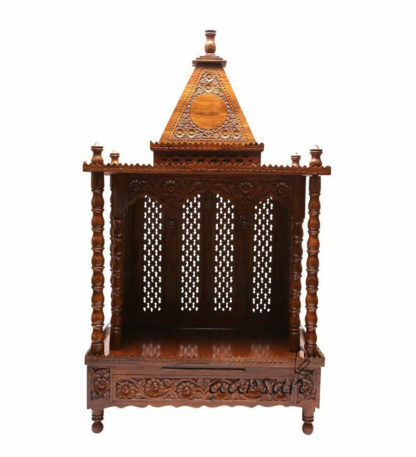 Aarsun Woods brings you Handcrafted Traditional Wooden mandir for Home and Office. The mandir is made from Seasoned Sheesham Wood with beautiful carvings all along the surface. As the wooden mandir is handmade by artisans, each unit has its own texture. The top of the mandir consists of a Dome also known as Shikhar placed at a platform thereby improving the overall height of the mandir. The Dome at the top of the mandir consists of Floral Carving in Front where Om or Swastik can be placed as per your need. The Main portion of the mandir consists of a Floral Carved Mehraab, four pillars and Jaali (NET) at the back. The inner portion consists of Jaali on the two sides alongwith the two Pillars. The floor of the Wooden mandir is made of premium quality Teak Plywood. The base of the Sheesham Wooden mandir consists of a full length sliding Drawer with similar carving matching the whole theme of the mandir. The whole mandir rests on four legs at the bottom. The product is made up of Sheesham wood gives natural look and delightful touch to your home and office. Please note that the Wood mandir is made from Sheesham Wood (Indian Rosewood) except for the base and the ceiling made in Teak Plywood.